Professor Anthony Hollander, Dr Joanne Phoenix and Philip Hammond MP. The Rt Hon Philip Hammond, Chancellor of Exchequer, visited Sensor City last week to see first-hand the breadth of entrepreneurialism taking place in the North West and the support available to early stage companies. Welcomed by Dr Joanne Phoenix, Interim Executive Director at Sensor City and Professor Anthony Hollander, Chair of the Sensor City Board and Pro-Vice Chancellor for Research & Impact at The University of Liverpool, the Chancellor was given an overview of the innovation hub’s activities and key achievements to date. Dr Joanne Phoenix also highlighted the technical innovation taking place throughout the sensor and IoT fields, particularly in the North West, and described the ground-breaking work being accomplished within other key assets in Liverpool’s Knowledge Quarter relating to the fourth industrial revolution (4IR). The Chancellor was then given a tour around Sensor City’s state-of-the-art mechanical and electronics laboratories, which are home to some of the most sophisticated equipment for sensor and IoT technology in the UK. Daniel Watson, Laboratory Manager at Sensor City, explained to the Chancellor how access to the PCB fabrication, 3D printing and tooling capabilities in the laboratories enables start-ups to design, make, test and validate their sensor application and IoT devices all under one roof, resulting in a more streamlined and cost-efficient prototype development process. In addition to the technical expertise and facilities available at Sensor City, the innovation hub has a thriving Membership programme and business support culture, promoting synergies and identifying growth opportunities for tech start-ups in the region. As one of only four University Enterprise Zones (UEZs) in the UK, a key goal for Sensor City is to drive collaboration between academia and industry and to foster their interaction. The Liverpool City Region is at the heart of 4IR activity which is set to transform the modern world economy, and many organisations are working cohesively to encourage digital innovation and increased participation in science, technology, engineering and maths (STEM) sectors, through programmes including LCR4.0, LCR Activate and Shaping Futures. Dr John Marsland, Head of Department, Electronics and Electrical Engineering at Liverpool John Moores University said: “We are working hard to develop a skills pipeline in sensors and electronics engineers. 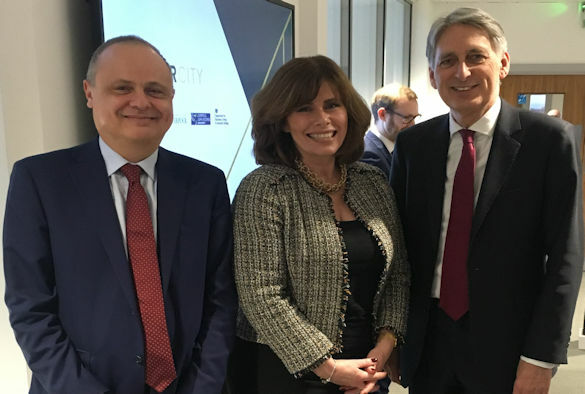 The Chancellor’s visit to Sensor City coincided with news that since 2014, British Business Bank programmes have facilitated over £2.5 billion of finance for North West entrepreneurs to help them start and grow their businesses. The Chancellor took the opportunity to participate in a private roundtable at Sensor City with representatives from local SMEs, the Federation of Small Businesses, Tech Nation and Sensor City’s University partners. Discussions focussed around how incubators like Sensor City are helping start-ups to grow, heard frontline experience of the challenges faced by tech start-ups and what the Government and other institutions can do to overcome these challenges. Two of the SMEs participating in these discussions were Sensor City resident members K-Safe and Defproc Engineering. Defproc Engineering undertake proof of concept and prototype work from their base in Sensor City, and access to the on-site laboratories has been a key factor in enabling them to deliver innovative health and social care devices for the Liverpool 5G Consortium. K-Safe’s intelligent road safety mobile app, Busby, has been developed to predict, prevent, detect and analyse road accidents and is set to be the most significant road safety development since the airbag. With the shape of the economy changing rapidly, the UK must ensure innovative businesses have enough development opportunities and access to finance to start up and scale up, in order to remain at the forefront of the technology revolution. As part of Sensor City’s commitment to creating a UK focal point for the development of sensor technology, while building a community of companies that are at the forefront of innovation, it has recently launched a fast-track growth package competition, to help small businesses scale, boost competitive advantage and innovative capabilities. Equally, the Made Smarter North West pilot is dedicated to giving North West manufacturers access to advice, insight and grant funding to implement new digital technologies to boost competitiveness and growth. Philip Hammond, Chancellor of Exchequer, concluded: “We are supporting innovators, backing billions of pounds of investment into the North West to support entrepreneurs and help them get off the ground. A joint venture project between the University and Liverpool John Moores University, Sensor City is supported by the European Regional Development fund (ERDF) and Department for Business, Energy & Industrial Strategy (BEIS).